Description - Our virgin rubber, full color, interlocking tiles are one of our top interlocking flooring solutions for customers who would like a solid, bright colored, rubber flooring system that is more durable than interlocking foam tiles. These interlocking tiles are sold in no cut kits which include beveled border and corner pieces, as well as Wall-to-Wall kits, which have center cut tiles only. For Wall-to-wall installations, some cutting will be needed to achieve a perfect fit. This can be done easily with a utility knife and a straight edge. This interlocking rubber mat system also carries a class 1 and 2 fire protection rating and help to provide a safe non-slip surface. Because these rubber floor tiles are made from virgin rubber with a wide color range, prices may vary between colors due to varying costs to produce each color. Each tile and color can be alternated to create a variety of patterns for those customers who would like to make their own custom designs. These virgin rubber tiles also come with a full 10-year warranty against wear and tear. Material – These tiles are made from vulcanized, virgin rubber. The Vulcanization manufacturing process produces the most durable, wear resistant floor tiles in the world. That means you have chosen the highest quality interlocking rubber tiles available on the market. Size – Center cut tiles are 2’ x 2’, border tiles are 1’ x 2’, and corner tiles are 2’ x 2’ overall. Weight – Each center tile weighs approximately 12 lbs., each corner tile weights approximately 8.5 Lbs., and each border tile weighs approximately 6 lbs. 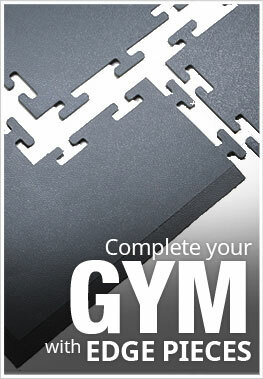 Recommended Uses – Our premium virgin rubber tiles have been used as home gym tiles, in commercial gyms, as interlocking exercise mats in schools, in kids play rooms, as basement flooring, and in a variety of other places where a durable, sound proofing, brightly colored, and non slip interlocking floor tile solution would be beneficial. Vacuuming any loose crumbs, dust, or debris from the rubber floor surface when necessary. Occasional damp mopping of the rubber tile surface with a mild soap and water solution. A few recommended soaps are Dawn dish detergent or Tide laundry detergent. Interlocking tile design makes for an easy installation. ***Virgin Black used when mixing with colors. Full virgin rubber tile. So the 'Recycled Black Virgin Pebble Tile' - is that a recycled rubber material or a virgin rubber material? Our Recycled Black Virgin Pebble Tiles are made with recycled virgin rubber material. As the other question asked, what is the "recycled black virgin pebble tile" made up of? Does it have a smell? How do you get virgin recycled material? Our recycled black Virgin Pebble Tiles are made from recycled virgin rubber material. Just like all of our virgin rubber tiles, these tiles will not have much of an odor. Will smell like a new barbie essentially. Want to understand the difference between the "standard black" and "virgin black" tiles shown. If the standard black tiles are recycled, what makes them different from any other recycled rubber tile? The Standard Black tiles in our Virgin Pebble Tiles are made from recycled virgin rubber which is different from our standard recycled rubber that is made from commercial truck tire treads. The Virgin black is made from never used black virgin rubber. Not The Best Price...Keep Looking! You can find this same product, SHIPPED, for the price of tile alone from this supplier. And, the others alow you to mix and match color, And have lower minimums. I was looking for these virgin rubber tiles since I wanted a bright red color and after looking around,these guys had the best price online. I never knew virgin rubber tiles would cost this much compared to some of the recycled rubber black tiles but I guess it is more expensive to make so what can you do. Either way, I did a wall to wall install with these tiles in a spare bedroom that I made into a play room for my kids. I used a local installer that had a lot of positive reviews from the website servicemagic.com and he made it look great. I am very pleased with my purchase and my kids really seem to love the flooring too. Black virgin rubber tiles were installed on engineered bamboo floor in basement for home gym. Easy DIY project for 1 or 2 people, no smell, pieces link together tightly with zero movement or play, and require a little coaxing and pounding with hands. The surface is hard, tough, not slick, yet with a cushioned feel. Takes hits well and recuperates. Cleats from clipless bike shoes leave surface indents that quickly disappear. Easily wiped down, but dirt does show on the black rubber tiles so if in a high traffic area, be prepared to work a bit at keeping surface clean. We have it in a small area for weightlifting and stationary bike so the tiles stay clean without any trouble. Biggest surprise was how heavy individual tiles were. Moving tiles into house and then down to basement was a workout. Cutting individual tiles with box cutter to fit uneven corners and around poles was hardest part. We did a lot of research prior to purchase so we did not order samples first. Tiles arrived quickly as promised. Sales representative on phone was very helpful when ordering. Very happy with the look, functionality, quality of tiles. Besides being practical, tiles defined workout space and added cool factor. These look great and went very easy.